Music was my refuge. I could crawl into the space between the notes and curl my back to loneliness. She started dancing to that fine fine music, you know her life was saved by rock and roll. Both the workshops and pop-ups are available across Scotland, throughout October 2015 for the SMHAFF. Dedicated website with regular updates and playlists here. Previous performances include the Outskirts Festival, Platform and Sense of Belonging (NHS Lothian), and touring with the Scottish Mental Health Arts and Film Festival. Created by musician, composer and artist Michael John McCarthy, with backing tracks by collaborative artists, designer Rachel O’Neil, writer Martin O’Connor and producer Alice McGrath. Turntable uses multiple art forms to connect, reach out and share experiences with individuals and communities in an exploration of the ways in which music can enrich our lives. One of Turntable’s key objectives is to combat loneliness & isolation experienced by the young and old across Scotland and UK. Last year the Office for National Statistics found Britain to be the loneliness capital of Europe. This social isolation epidemic is most often considered a problem for the elderly, however it’s important to note that it’s not just older people that are affected. A report by the Mental Health Foundation in 2014 found loneliness to be a greater concern among young people than the elderly. In pursuing this objective, Turntable intends to reclaim music as a communal experience whilst also celebrating each participant’s individual relationship with the key songs & albums in their lives. A hosted group workshop where participants select records to play, share musical memories and reflect on the place of music in their lives. 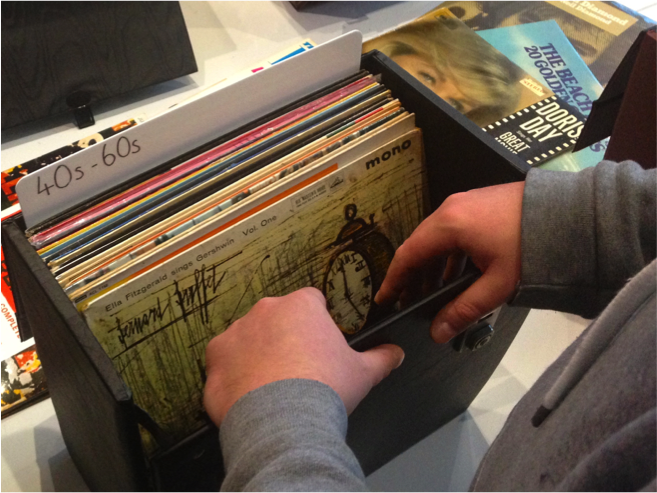 A pop-up installation which can take place in a diverse variety of social spaces (cafes, libraries, arts centres, drop-in centres etc), inviting passers by and participants to browse a selection of LPs, select and play a record of their choice and engage in a one-to-one conversation with a Turntable host. Turntable is working with the SMHAFF in 2015 and 2016 to develop the project and connect with audiences across Scotland.